John Hardy reissues the Naga Collection in celebration of the Lunar New Year on January 23, which marks the return of the Year of the Dragon. Every twelve years, this mythical monster reemerges, heralding a bright future full of energy and success for those born under it. Pave white topaz, black sapphire, or Swiss blue topaz. 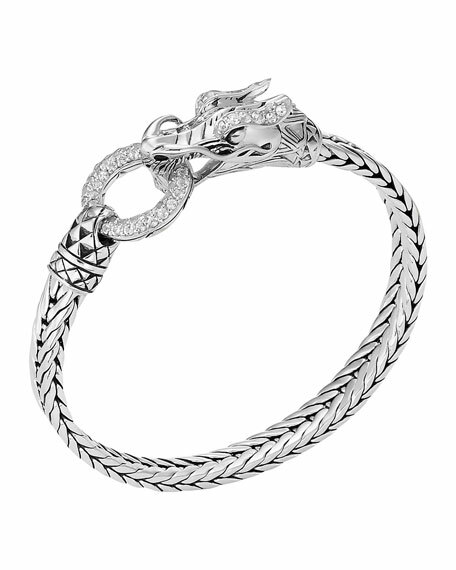 About this collection: Naga means 'Dragon" in Balinese and is the symbol of health and prosperity. The Naga collection is distinguished by rich textures and a play of contrasts, with exquisitely carved figurative dragon elements and alternating abstract patterns inspired by the dragon's coat of mail. The hand-woven Naga chain reaches new levels of complexity.